Amanda Bynes is claiming her very public meltdown, including a head-shaving and an arrest, was in fact a desperate publicity stunt. 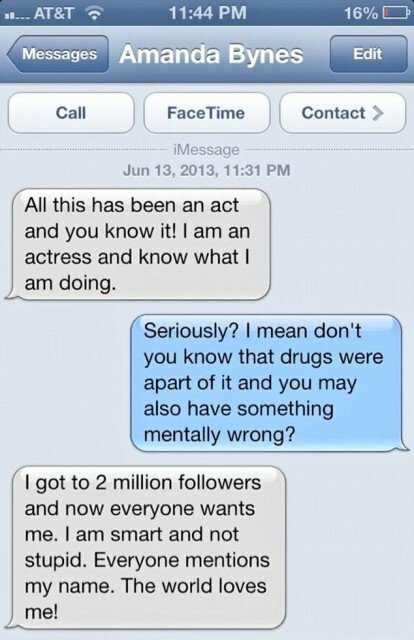 On Thursday night Amanda Bynes, 27, apparently sent a series of text messages to her friend Jonathan Jaxson – who promptly posted them on his Twitter account. In them Amanda Bynes appears to admit her increasingly strange behavior was nothing more than a childish ploy to increase her fame and gain more Twitter followers in advance of a movie role. Given Amanda Bynes’ previous highly publicized dramas, it’s hard to know if she is being genuine or not. If it is, she is likely to infuriate fans who have been worried about her mental health in recent months. It was Jonathan Jaxson who called police on the night she was arrested for allegedly throwing a b**g out of her 36th floor apartment window last month because he feared she was suicidal. Jonathan Jaxson told Radar Online hours later: “I got police to be able to go to her home. I am told they found drugs and other things. Later Amanda Bynes caused a stir by shaving her head and sporting a bad platinum blonde wig. But it is Amanda Bynes’ Twitter use that has caused most cause for concern having become increasingly out of hand with her hurling insults at fellow celebrities. In recent months she has called both Miley Cyrus and Drake “ugly” and said Chris Brown assaulted Rihanna because she wasn’t pretty enough. Last week things went from bad to worse as Amanda Bynes was evicted from her Manhattan apartment. Amanda Bynes’ worried father Rick has been hoping to stage an intervention but she refuses to see him.